Black-eyed Susans (Rudbeckia hirta) are equally as stunning when mixed with other plants in a domesticated flowerbed as they are growing wild in a field awash with their flowers of bright, yellow-gold petals contrasted with dramatic, dark chocolate, conical centers. 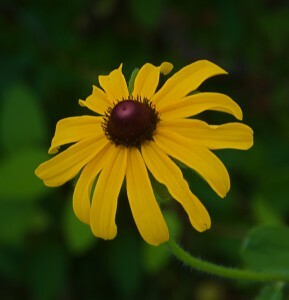 Native to western North America, the Black-eyed Susan’s spread eastward began in the 1830’s when it was accidentally mixed with clover and hayseed bound for the eastern United States. Once introduced in the new locations, it thrived very well and is now found throughout much of North America. 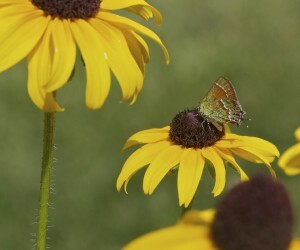 There are 23-25 species of Rudbeckia, plus many varieties and cultivars. In the 18th century Carl Linneaus, the father of the plant binomial system, named the genus in honor of Swedish botanists Olaus Rudbeck, Sr. and Jr. Both father and son were Linneaus’ botany professors at the University of Uppsula when he was enrolled there as a medical student. Linneaus named the species “hirta”, which means, “rough, hairy” and is descriptive of the plant’s stems and leaves. The R. hirta is considered a biennial. Basal leaves appear the first year but remain low to the ground and will wait until the following year to bloom. In the second year it will grow to a maximum of 3 feet and produce flowers. R. hirta has hairy, oblong, toothed leaves that grow alternately along a sturdy, hairy, erect stem. Blooming May through September and even into October, the flowers have dark brown, fertile, cone-shaped centers rimmed with 12 to 16 sterile yellow-gold petals. As the flower opens, the petals tend to slope downward and slightly curve under. The cones produce an abundance of tiny, fertile seeds. In some areas the R. hirta can behave either as a perennial or an annual. Because it is a biennial, R. hirta should be planted annually for the first few years to ensure there will always be flowering plants every year during the spring through autumn blooming season. They can be easily transplanted or propagated by seed either in late summer to mid-autumn or in spring when there is no longer a chance of frost. They prefer full sun and sandy soils. The R. hirta does not have a deep taproot, but does send out an abundance of tiny, shallow, lateral roots that will form clumps. The large number of roots will seek out and draw in water, aiding in the plant’s survival during dry spells. The bright, yellow-gold petals lure a variety of butterflies, bees and other pollen/nectar-loving insects, to the fertile, conical center. The pollen-laden cones satisfy the diet of short-tongued and long-tongued insects feast on the sweet nectar of the numerous, little, tubular-shaped cone flowers. For gardeners looking for plants that attract butterflies and bees, the R. hirta and its cultivars are excellent choices. R. hirta has been shown to be effective in controlling erosion when planted on slopes, roadsides and hilly landscapes and does not appear to have a problem with garden pests or diseases. Even though it is not native to the State of Maryland, the Black-eyed Susan (R. hirta) was adopted as that state’s flower in 1918. Every year the Pimblico racecourse in Baltimore, Maryland hosts the Preakness, which is the second leg of horseracing’s Triple Crown. The race is also known as “The Run for the Black-Eyed Susans”, where the winning horse is presented with a blanket made of the striking yellow and black flowers. Also known as Coneflower, the Rudbeckia shares that common name with its cousins of the Echinacea, Dracopis and Ratibida genera. The cone-shaped centers of the Rudbeckia flowers are more rounded and not as tall and elongated as species in the other three genera. 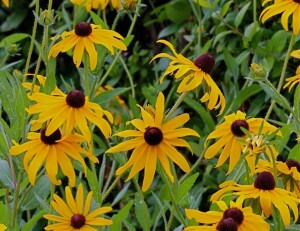 The Black-eyed Susan is the symbol of encouragement. Considering its history of adaptability when it traveled from west to east, this is obviously a plant that in its determination to survive will bloom where it’s planted. And if there is one thing gardeners need, especially around mid-August, it’s encouragement.